Sustainable investment is becoming more and more mainstream. But what exactly does this form of investing mean? Investors can exclude companies and activities that they find controversial. Companies can be excluded on the basis of products they make, such as weapons, or because of the production process or the supply chain, such as when a company uses child labor. In addition to companies, countries can also be excluded. In the case of positive selection or the ‘best-in-class method’, investments are only made in companies that score best on sustainability criteria within their sector. ESG criteria are Environmental, Social and Governance criteria. In ESG integration these criteria are taken into account in the investment decision. Active shareholders can exercise their voting rights at the shareholders’ meeting. When voting, a sustainable shareholder takes environmental, social or governance criteria into consideration when voting for or against a proposal. The shareholder can also initiate a proposal himself. With companies of which an investor is a shareholder or bondholder, a dialogue can be started about the sustainability performance of the company. This type of dialogue is also called engagement. Impact investments are investments that have been made with the intention to generate positive social and environmental impact. Examples are investments in clean energy, education and microfinance. In classical investing, the primary focus is on financial results. Classical funds meet minimum legal requirements in the field of sustainability such as the exclusion of cluster munitions. In addition to legal obligations, responsible funds avoid the most controversial activities, such as activities that violate the UN Global Compact principles. An instrument like engagement is often used. ESG criteria can have a weighting in investment decisions, but are usually not of a determining nature. A fund systematically uses one or more instruments, aimed at promoting sustainable business operations. For example, the fund invests in a reduced business universe, with a focus on more sustainable companies. ESG criteria have a major weighting in investment decisions. A sustainable fund sets itself up as an active owner and addresses sustainability on a structural and frequent basis. The investment philosophy and documentation provide a transparent and clear picture of how the fund implements sustainability and what effects it intends. The application of instruments is described and the report mentions sustainability instruments and performance. Regular sustainable funds are investment funds that meet the characteristics of sustainable investment, as described above. Impact funds focus specifically on demonstrably achieving environmental and/ or social change. Impact investments are mostly in projects and companies that are not listed on the stock exchange. Green investments are investments in funds that participate in environmental projects. 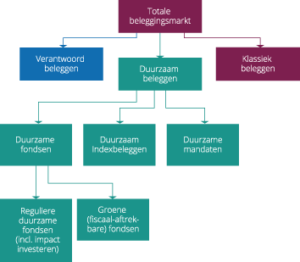 These green investments enjoy tax exemption in the Netherlands. Increasing attention is paid to sustainability in index investing: shares spread out in a basket of shares whose returns are about the same as those of the stock market as a whole. When the client gives the managing institution extensive authority over the interpretation of the investment portfolio, it’s called a management mandate. A sustainable management mandate is such an outsourcing where the manager only purchases sustainable funds and titles.